According to IMDB, Robin Hood: Prince of Thieves—which turns 25 this year—was the tenth most popular film in 1991, but that didn’t stop every publisher from jumping on the tie-in bandwagon. Signet put its entry in the capable hands of speculative anthologist Martin H. Greenberg, who compiled a collection I mostly forget except for Ed Gorman’s “Team Effort”—a succinct little piece that gets its basic world building out of the way in one sentence and moves on to the much more interesting emotional crisis in the wake of an accidental death that Marian considers to be her fault. Tightly written, single scene and gripping, “Team Effort” is a poignant, fresh take on Robin Hood and his Merry Men—and guilt. Lately I’ve been working on the overwhelming task of thinning out my book collection; it’s something no book lover likes to do, but let’s face it, every once in a while it has to be done, either to clear clutter or make room for more. It’s no surprise that a good portion of my collection is devoted to short story collections. I’ve read my share of great stories, and I’ve read my share of awful ones—but I’ve also read my share of a few that blew me away to the point at which I’ll never forget them. So instead of doing a typical “Top” list, I decided instead to focus on ones which fall into the last category (please note that in my “about” descriptions I tried to be spoiler-free). Do you have any that have made a lasting impression on you? Leave them in the comments. Posted on August 14, 2016, in Short Stories and tagged Ed Gorman, Martin H. Greenberg anthologies, Robin Hood-based fiction, Science Fiction Short Stories, story about little girl in tree and Robin Hood, Team Effort, The Fantastic Adventures of Robin Hood, time travel short stories. Bookmark the permalink. 2 Comments. 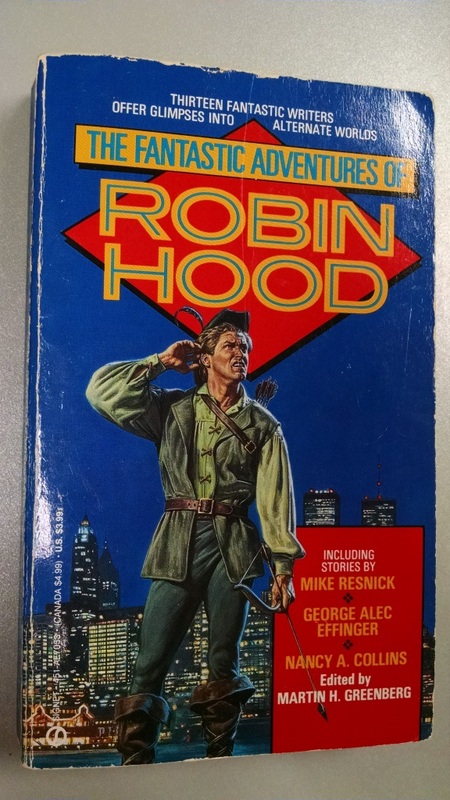 I knew Greenberg was active–I have a few of his collections (this Robin Hood one, though, is my favorite). Looking at that list was fun! Even though we have a great many interesting anthologies being published today, it seems like there just isn’t quite the same variety. He is definitely missed. Oh my! I had no idea I was on there. It’s missing tons of things, but that’s fantastic! Thank you! !